6 Tips for Planting Bare Root Fruit Trees in Santa Barbara | Down to Earth Landscaping Inc.
Fruit trees and Santa Barbara go together like peanut butter and jelly. Many of our streets are so named for the groves of fruit trees that used to grace the street that now house much of our community. Olive, lemon, walnut, avocado: these are just a few of the trees that call Santa Barbara home. As with many of the coastal regions of Southern California, Santa Barbara fruit trees can provide some of the sweetest, tastiest fruit available. January is the best time of year to get those bare root trees in the ground. Tip 1: Plant bare root trees within 24 hours of acquiring them. If you cannot plant them within a day, place tree into a pile of soil or a bucket of soil mix. Tip 2: Soak the roots overnight in a mixture of water and Vitamin B1. Vitamin B1 can be found at your local hardware store. This will prevent the roots from going into shock. Tip 3: Dig a whole in which to plant the tree. The hole should be approximately double the size of the root ball. It is not necessary to dig a hole deeper than the length of the rootstock. Soften and amend the surrounding soil. Refer to our previous blog on soil amendment if you are unaware of your kind of soil. Tip 5: Make sure that the tree is approximately 1-2 inches above grade. This keeps the tree from developing root rot and insect damage. Tip 6: Make sure you install an irrigation system with the tree. We recommend a drip system. If you are unable to do so, you should check frequently for moisture. DO NOT ALLOW IT TO DRY OUT. When you do water, you should water deeply. *Note: Some suggest that you should paint the tree trunk of a young fruit tree in order to keep the tree from becoming sunburned. This method is unnecessary in Santa Barbara, as the climate is moderate and unlikely to scar young trees. You have much more variety to choose from since most nurseries have space for only a small selection of fruit trees in containers. Bare-root plants are less expensive than those in containers because they don’t have to be potted up for sale, and come from the grower in soil-less bundles. This means they’re light and easy to transport. Just make sure roots are packed in something like damp sawdust—if they dry out at any point between the nursery and the planting hole, the plant may die. They establish themselves faster than the containerized fruits that nurseries sell later in the year. Are there any fruit trees that don’t grow well in Santa Barbara? 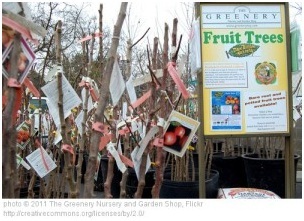 Believe it or not, there are actually fruit trees that don’t produce well in Santa Barbara. Trees that require cold, frozen winters will not produce well in Santa Barbara. Peach and cheery tress are two examples. These trees may, however, produce well in the mountain areas and in the Santa Ynez Valley.